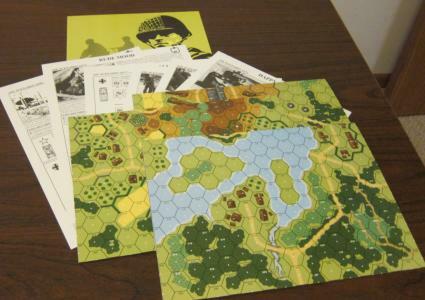 It is a pleasant thing, indeed, to reflect upon the fact that for the first 10 years in the history of the Action Pack (a small ASL product consisting of several new geomorphic boards and a collection of scenarios), the series numbered only two. For many years, indeed, it was assumed that this number would never increase, that the Action Packs would join many past official and unofficial stunted product series. In 2007, however, a ray of light appeared, when a third action pack was published. 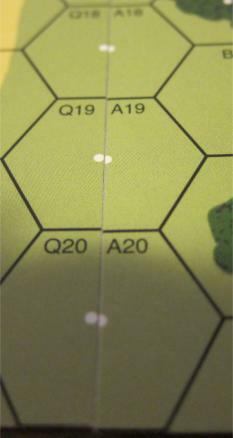 Still, even this product, though it had a dozen new scenarios, included only reprint mapboards. Those who dared to hope were, however, soon to be rewarded with a renaissance of Action Packs that, in the space of four years (2008-2011), caused the number of Action Packs to leap to eight; this one, Action Pack 8, being the latest. The plethora of new maps added to the system (in addition to a few new maps added from other sources, like “Bonus Packs”) have, moreover, provided considerable new impetus and energy to official and unofficial scenario designers, who have been given considerable new material to work with beyond the 52 boards that dominated ASL during the first 20 years of its existence. 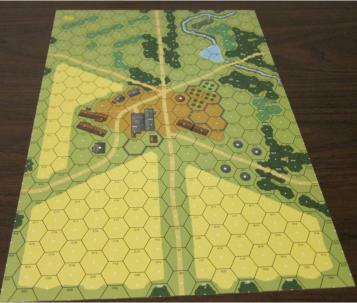 Action Pack 8 is the second Action Pack designed by Gary Fortenberry (following Action Pack 6) and similarly the second Action Pack to feature the “alternative” geomorphic mapboards (i.e., 11″ x 16″ geomorphic mapboards that match to board halves of standard geomorphic mapboards). 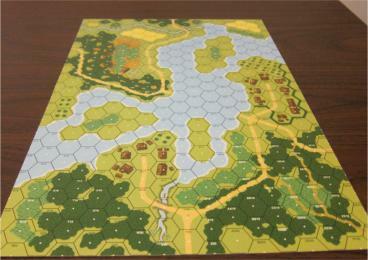 Action Pack 8 introduces three more of these double-sided geomorphic mapboards to the system. It also provides 10 scenarios that use them, all of which, like most of the Action Packs published since 2007, fit a theme. 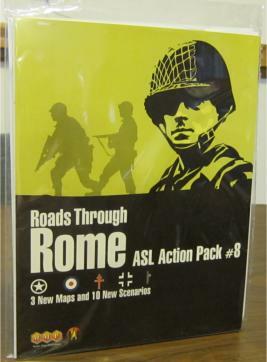 In this case, the theme is “Roads Through Rome,” and the scenarios, except for a prologue scenario set in Tunisia, all take place during the first year of the war in Italy. As mentioned, the maps are double-sided. What this means in practice is that each map contains a nearly identical version of itself on its reverse side. The only difference is that some of the tree half-hexes are moved a few hexes to one side, to allow the maps to mate up with other maps a bit more cleanly (though there are still ways that they mate with other maps that can leave half-forest hexes). This is a lot of effort to go through for such a small effect; moreover, it adds at least a little to the cost of the product. It also irritates those ASLers who use the maps as masters for photocopies maps that are either laminated and/or enlarged, as they now have twice as much work to do for each map, and each map takes up more space. This is probably the one element of the alternative geomorphic mapboards that could easily be abandoned. So how do the maps look? In terms of artwork, the maps are very crisp and well done. Fortenberry and Charlie Kibler are credited with the map design, and Kibler did the artwork. The only criticism one can offer is that some of the board edges are not cut exactly at a half center dot (see image). Board 4a/b is the board that probably would get the least use, in its natural state. This map depicts a farm complex with large fields creating a semi-circle around a complex of farm buildings (the other semicircle is less developed, consisting of brush, woods, and a stream). The farm complex is nice because they are actually quite rare in ASL (though by no means rare in the real world), and the map also has far more realistic fields than most ASL maps do. The only drawback is that the map, as drawn, places most of the building complex on a level 1 hill, which is just a bit odd. There are probably not that many scenario situations that would call for such a configuration. However, scenario designers can, with little problem, decree by SSR that the hill does not exist, thus making the board suitable for a much greater number of scenario situations. Board 5a/b depicts a large hill mass, with a wood-buildinged hamlet to one side. The hill mass is partially covered with brush and woods. 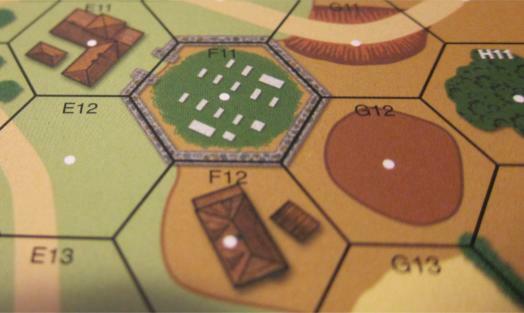 It is always nice to have more hill configurations in ASL, especially larger ones, and the dimensions of this type of board allow for a different hill shape than large hills by default must take with the traditional geomorphic mapboards. The map could easily be well suited for a variety of actions in Italy, the Balkans, southern France, Burma, the Philippines, and elsewhere. There are, however, too many buildings to easily transform it with overlays into a pure wilderness board. Board 6a/b is another river bend board, similar to board 3a/b from Action Pack 6. 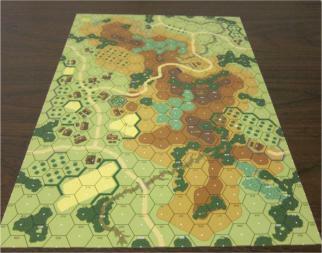 It is true that another river bend board would probably not have been high on the list of map priorities for most scenario designers, but this bend board is actually fairly useful in that it has few buildings on the board, and the building hexes that are there are multi-buildinged wooden building hexes. This means that they can serve as huts. Or, since they are clustered into two relatively small clusters, overlays can easily be used to eliminate them altogether. This makes the board well suited for PTO terrain. It is well suited for a number of scenario situations in Burma, the Philippines, and elsewhere. Alternatively, just one side of the river can be used as a “coastline” as well. All in all, the maps are nice additions to the system. The 10 scenarios are all designed by Gary Fortenberry. Except for one set in Tunisia, they are all set in Italy from September 1943 to September 1944 (with none from the subsequent winter campaign or final offensive in Italy). 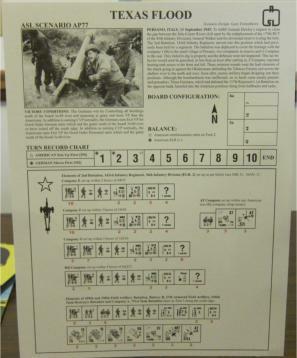 Each comes with optional “Australian Balancing System” provisions; the ABS is a controversial bidding system for choosing sides. However, since it is optional, those not interested in it need hardly concern themselves. Ah, Italy. As the nuns at Nonnberg might sing, how do you solve a problem like Italia? Not only was it a backwater of World War II, but it is a backwater of ASL as well. No official ASL product has ever before focused on the war there, with only occasional scenarios appearing here and there on the subject. The larger, unofficial world has come up with several historical modules (like those on Cassino) and a few packs. Still, these offerings are nothing like those compared to the East Front, the West Front, or other popular ASL subjects. Some people have asked why this is so. Part of it might have to do with the backwater aspect of the war, while another part might have to do with the relative absence of armor, or a comparative lack of “famous” units. The image that many people have in their minds of the war in Italy is a long, grueling slog up the Peninsula, and this is an image that has some basis in fact. So, in this sense, Fortenberry is a bit brave to create an entire collection of scenarios set in Italy and it will be interesting to see over time if their subject matter has any bearing on how they are received. The Germans are the foes in every scenario. Their opponents are primarily the Americans (7 scenarios), with a few other nationalities making pro forma guest appearances (1 scenario each): the British, the Canadians, and the Free French. The scenarios are almost all large in size, with only three scenarios that can be considered small or medium-sized. Most are not suitable for tournament (or an afternoon/evening’s worth of) play. No scenario uses Night rules, and only one scenario uses Air Support rules. However, a full half of the scenario mix includes one (or more) modules of OBA. Oddly, considering how much the war in Italy was very much an infantryman’s war, the scenarios in AP8 are very AFV-heavy. Every scenario has at least 4 AFVs in it and, in fact, the average number of AFVs in an AP8 scenario is 13.6 (!). Several scenarios have more than 20 AFVs in them. The combination of size, OBA, and vehicle-heavy OBs mean that this pack is not well suited for beginning or novice players, unless they are up for a real challenge. Adding to the challenge is the fact that many of the scenarios have complicated victory conditions. Indeed, not a single scenario has a straight-forward one-condition victory requirement (such as “The Germans win at game end if the capture all stone building locations”). All scenarios have at least a two-provision victory condition, with the victory conditions of some scenarios taking an entire paragraph to explain. A number of the scenarios use an odd victory mechanic, which is usually phrased along the lines of “by controlling building hexes within the German setup area >x times the Turn number” (where x is usually 3 or 5). These extreme victory conditions take a couple of scenarios that would otherwise be quite playable and make somewhat of a headache out of them. For example, here are the victory conditions for AP82 (Coriano): “The Canadians win at the end of Game Turn 4 by amassing ≥ 1 VP, at the end of Game Turn 5 with ≥ 2 VP, at the end of Game Turn 6 with ≥ 3 VP, or at game end with 4 VP. The Canadians receive 1 VP for each of the four areas below if there is ≥ 1 Good Order Canadian Infantry unit and no Good Order German unit within it: a) 21BB1-BB9-FF5-BB1; b) 21Y1-W2-W5-Y5-BB4-BB1-Y1; c) 21W5-W8-BB9-BB4-Y5-W5; d) 21U3-W2-W5-W8-S6-U3. For VC purposes, the roads forming the boundaries of each area are not ‘within’ the areas themselves.” See images for another example. Designer Gary Fortenberry has staunchly defended the victory conditions in AP8, but it is hard to escape the conclusion that some of them could have been simpler without the scenario losing much. Luckily, most of the scenarios are not SSR-intensive. Nevertheless, even a number of experienced ASL players may not find many of these scenarios to their tastes, or will want to play them only occasionally. Based on a couple of years of play, the most promising scenarios appear to be AP74 (Batty-P), AP75 (Gabriel’s Horn), AP78 (Crossfire), and AP82 (Coriano). Generally speaking, most of the scenarios seem pretty balanced, which would suggest strong playtesting (something of a lost art in ASL, it sometimes seems). Because of the maps in Action Pack 8, which will inevitably be used in a wide variety of future official and unofficial products, most ASLers will want to get this product to add to their collection. For some, however, the scenario content may prove only a secondary motivation to the maps.